Rejoice's Goal is to provide the much needed medical and social support system to the poor, sick and under-privileged living in Chiang Mai's villages and the surrounding hill areas. In particular, working together with HIV health care workers from rural hospitals, Rejoice addresses the diverse array of medical and social needs of HIV/AIDS affected people. Rejoice has no religious or political affiliation and does not discriminate on the basis of race, gender, socio-economic status, sexual orientation or ability. Based in the city of Chiang Mai, Rejoice Mobile Clinic visits communities as far afield as Mae Ai in the north to Chom Thong in the south. Emotional support; counselling, community meetings focused on education and prevention of HIV and other STDs. Rejoice's programmes cater to a variety of needs, there are HIV/AIDS medical care, HIV/AIDS education and prevention programmes, free infant formulas, education sponsorships and one to one counselling. The distribution of infant formulas has been very effective. Apparently, babies born to infected mothers may not develop HIV/AIDS if not breastfed. HIV Outreach Clinics The Outreach Team makes weekly visits to over 300 patients and their families in established clinics in 6 diverse areas of Chiang Mai Province. HIV Home Care Home care visit are made to over 350 patients in co-operation with HIV health care workers, to the more isolated villages and communities. The formula milk programme serves 13 pre-school children including 4 babies recently born to HIV +ve mothers. 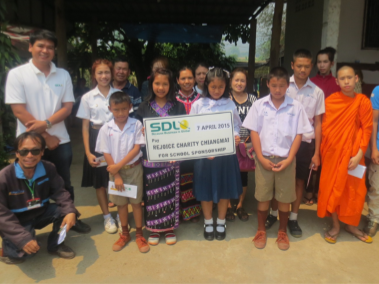 73 students benefit from the School Scholarship Programme mainly supported by individuals on an annual basis. Annual Excahange Meetings are hosted to bring together the volunteer HIV health care workers from all hospitals to discuss experiences and problems whilst enjoying each others company. Education and Prevention Meetings sponsored by Rejoice are held together with hospital healthcare volunteers at various venues. Each year over 500 youth and HIV patients attended the meetings.